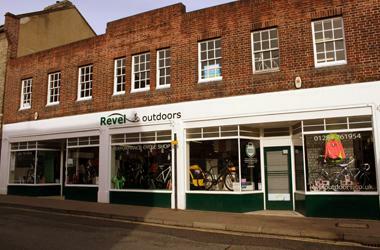 Revel Outdoors is a professional and friendly cycling and tri shop. Their shop have an extensive range of cycles, accessories and clothing including triathlon kit. They cater for all types of cyclists, from children's bicycles, to traditional commuters and leisure hybrids, through to high-end road, triathlon and mountain bikes. Their professional service centre is staffed with experienced Cytech trained mechanics for all servicing and repair work. They also offer custom bike and wheel building for something a little more bespoke. Revel Outdoor's products are carefully selected, offering excellent value for money and items that are fit for purpose. They offer a bike fitting service to help ensure you get the most out of your riding. Between the staff members they use most of the products they sell and can help with advice and recommendations in all areas.